With an estimate of 350 million people in the world having diabetes by the year 2030, diabetes will be an enormous cause of neuropathy. Approximately 50% of those people developing diabetes will develop a clinically significant neuropathy. In addition, the increase in prediabetes prevalence, and the associated increase in neuropathy risk in that cohort, suggests an epidemic of neuropathy that is going to be a challenge for the healthcare system to handle. The majority of individuals with diabetic neuropathy have type 2 diabetes (~95%), although large numbers of individuals with prediabetes are at risk for any associated distal neuropathy as well. Typically individuals with type 1 diabetes do not develop neuropathy until at least 5 years after diagnosis, while those individuals with type 2 diabetes may have neuropathy at the time of diagnosis. 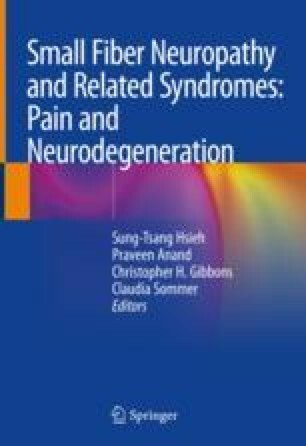 Neuropathies can vary in clinical presentation from a distal symmetric neuropathy, mononeuropathy, cranial neuropathy, plexus neuropathy, or even autonomic neuropathy. In this chapter, the clinical presentation, diagnosis, and management of the various diabetes-related neuropathies are reviewed.